The Samsung Galaxy Tab 2 10.1 is the rather wordy successor to the popular Galaxy Tab 10.1, an Android tablet which managed to challenge the iPad in almost every department, which are some pretty big shoes to fill. Unveiled by Samsung in February at MWC 2012, the Galaxy Tab 2 10.1 was confusingly launched alongside the Galaxy Note 10.1 which sported a similar, if slightly more premium, look and a S-Pen stylus, something the former does not have. 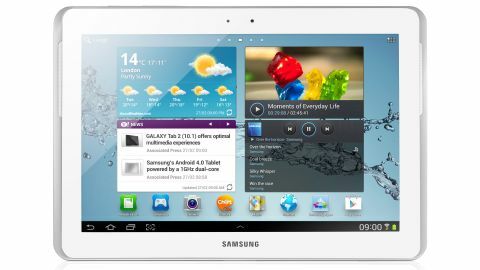 However unlike its blockbuster predecessor, the Galaxy Tab 2 10.1 is only available with 16GB of internal storage and Wi-Fi only, and launch at a £299 price tariff. However the cost has taken a tumble and you're now able to pick it up for under £240 in a few outlets. The lack of a 3G model in the UK and larger storage capacities means that the Galaxy Tab 2 10.1 isn't as much of a contender to the new iPad as the original was to the iPad 2, with the middle to high end of the market more suited to its price. Where does this leave the Tab 2 10.1 one then? Well, rubbing shoulders with the likes of the Toshiba AT200, iPad 2, Asus Transformer Pad 300 and Acer Iconia Tab A200. Take one look at the Galaxy Tab 2 10.1 and you'll notice immediately that it's undergone a dramatic redesign from the original Galaxy Tab, as Samsung looks to distance its devices from Apple's iconic iPad – something which has landed the South Korean company in trouble before and seen the Galaxy Tab 10.1 taken off the shelves in some countries. The result: a two-toned black and grey tablet with what can only be described as ears – which are actually two speakers either side of the 1280 x 800 LCD display. The large black bezel around the screen is further increased by the additional grey plastic chassis wrapping round from the back, providing some unnecessary bulk and little design flair, something other tablets like the uniquely shaped Sony Tablet S manage to bring to the table. The Galaxy Tab 2 10.1 isn't huge, with its 9.7mm deep body meaning it's actually a shade slimmer than the Transformer Pad 300 and Iconia Tab A200, although it does feel porkier than the iPad 2 (8.8mm) and super-slim AT200, which clocks in at a mere 7.7mm. The unassuming lighter grey plastic back of the Tab 2 10.1 leaves little to be desired in the style department, giving off the air of cheapness. However the tablet does feel strong and well built, with no flex experienced with the case or screen. Thanks to the plastic build, Samsung has managed to keep the weight of the Galaxy Tab 2 10.1 at a reasonable level, with the slate tipping the scales at 587g, making it lighter than its Acer, iPad and Asus rivals, but once again the dinky Toshiba steals in at 558g.